Pen words as insightful and timeless as Aesop’s in a journal lined with his fables. 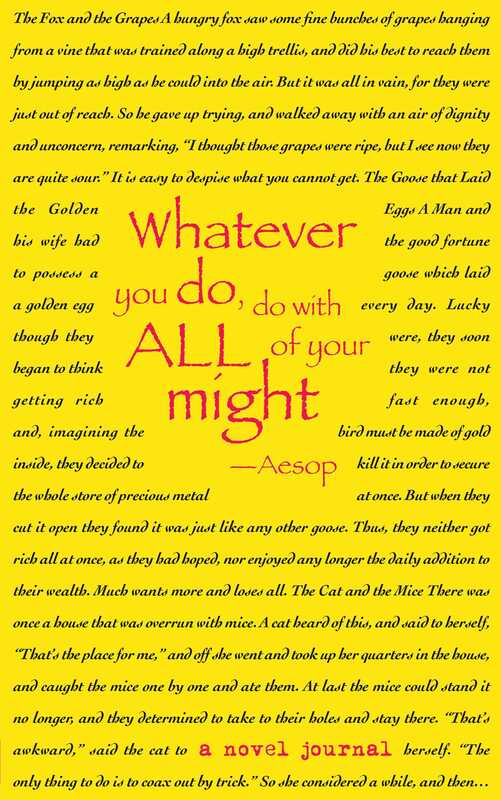 Aesop was a slave and fantastic storyteller who lived in ancient Greece around 620–564 BC. No writings by him exist (if they ever existed at all), yet his tales have survived and been shared through oral tradition around the world. In many stories, he uses animals as the main characters to convey deeper meanings and morals that still ring true today. A Novel Journal: Aesop’s Fables infuses new life into these classic tales by inviting writers to pen their own stories and ideas between the lines of the fables. In a type so tiny as to nearly disappear, the entire text of Aesop’s Fables forms the lines of this journal. Perfect for daily journaling or drafting the next classic, this homage to Aesop’s work adds an element of excitement to any writing project. Packaged with a Svepa cover, brilliant endpapers, colored edges, and matching elastic band to close pages tight, this book is a great gift or collectible for anyone who loves fables. And the compact size makes this journal easy to slip into a purse, briefcase, or backpack so you can record and revisit your thoughts on the go. Aesop was a fabulist or story teller credited with a number of fables now collectively known as Aesop's Fables. Although his existence remains uncertain and (if they ever existed) no writings by him survive, numerous tales credited to him were gathered across the centuries and in many languages in a storytelling tradition that continues to this day. Many of the tales are characterized by animals and inanimate objects that speak, solve problems, and generally have human characteristics.